The NTSB last week distributed 27 safety recommendations before issuing its findings on the probable cause of the July 6, 2013 crash of an Asiana Airlines Boeing 777 just short of Runway 28L at San Francisco International Airport. The majority of the recommendations were issued to the FAA, with the remainder divided among Boeing, Asiana Airlines, the Aircraft Rescue and Firefighting Working Group and the city of San Francisco. The NTSB found the Asiana pilots were primarily responsible for the accident because they mismanaged the final approach path and inadequately monitored airspeed. “The captain selected an inappropriate autopilot mode and took other actions that, unbeknownst to him, resulted in the autothrottle no longer controlling airspeed,” said the NTSB’s June 24 report. Three people died in the accident, including two women who were ejected from the rear of the airplane on impact. The NTSB believes two of the women killed were not wearing seat belts at the time of the accident. One hundred eighty-nine others were injured, 49 of them seriously. In a question-and-answer session following the presentation of the report, board member Robert Sumwalt challenged publicly raised doubts over the competence of the Asiana crew. “I don’t happen to believe this accident is about crew competency,” he said. “Yes, the instructor pilot could have been better trained to oversee his trainee, but the pilot flying had over 10,000 hours. I think this is a case of the pilot flying expecting the aircraft to do something…it was not designed to do. That expectation came from training that may have misled him, but also from documentation that our investigation showed was not totally clear…The ground instructor who taught the pilot monitoring [on this flight] described the autothrottle going into the hold mode as an anomaly. It’s not an anomaly. It’s the way the aircraft was designed to operate.” Sumwalt indicated that he had learned from other Boeing 777 operators that the aircraft’s autothrottle hold mode is not well understood. 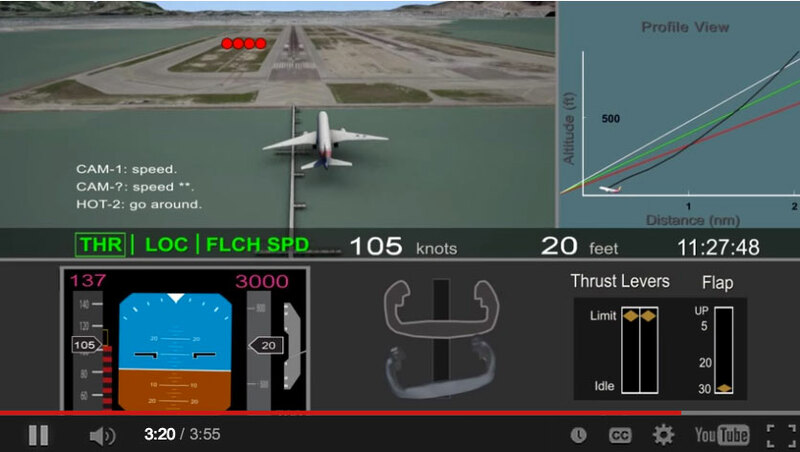 The NTSB posted an animation of the flight's final approach. Sumwalt's statement is incredible. Not incompetent? These guys crashed a perfectly good $300M airplane with a long record of safe operation, killing three people in the process, in perfect VFR conditions, because they didn't know how to fly a manual approach. They failed to monitor their airspeed, failed to look out the window, failed to do required callouts, and the PF set the auto-pilot to climb to 3000' during final approach, and then half-turned off the flight director, which put the system in the mode they didn't expect, even though the mode was displayed right in front of them. And what about setting up a virtual ILS using the GPS system? Not incompetent? That is absolutely absurd. It is pretty clear that like the PF who stalled and crashed AF447, and the two people who panicked, stalled, and crashed the Colgan Air flight during the approach to Buffalo a few years ago, the Asiana pilots were not qualified to be in the cockpit of a commercial airliner. I don't care how many hours they had. Those hours were accumulated pushing buttons on a computer, but when manual flying skills were required, they failed tragically (thank goodness these guys weren't flying the UA flight in NY that Capt. Sullenberger brought down safely in the Hudson in a magnificent display of quick decision-making and flying skill). How do these people get through the examinations that lead to putting them in the cockpit of a commercial airliner? We need to look at this carefully. Training is one issue and verifying that the training has worked is another. Knowing the details of the 777 auto-flight system is something that can easily be test for; it clearly wasn't done in this case. And if Sumwalt is right that many don't understand it, then there's a systemic testing problem here. But the people Sumwalt quotes also are not crashing 777s. Despite what Zumwalt would have us believe is the system's quirks, these people are landing 777s without dead bodies and wrecked airplanes. Another sign of incompetency, for me, is the PF's attempt to correct his too-low altitude by pulling up the nose. Aren't we taught from day one to control altitude, particularly when perilously close to the ground, with power? By pulling up the nose, he risked a stall close to the ground. Another clear indication that this guy had no idea how to fly an airplane.